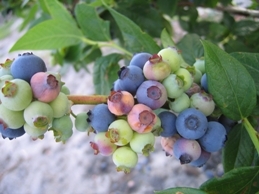 Blueberry insect pests can reduce yield and quality. See here for information on their biology and management. Blueberry pollinators: Blueberries are a pollination dependent crop. Learn about key pollinator species and their management here. Small Fruit, Specialty Crop, and Tobacco IPM This blog is maintained by N.C. State entomologist, Hannah Burrack. It includes coverage of IPM issues that affect blueberry growers and pest management decisions. North Carolina Agricultural Chemicals Manual This manual provides growers, Extension personnel, researchers and other agricultural professionals with the most up-to-date information available on the selection, application, and safe and proper use of agricultural chemicals. The online version is updated as changes in recommendations occur throughout the year. Blueberry Disease and Insect Management for Organic Growers in North Carolina This guide identifies the pest and disease pressures at various times during blueberry production and suggests appropriate control methods for organic producers. The Southern Region Small Fruit Consortium annually updates its Blueberry IPM Guide. This comprehensive guide details management recommendations for diseases, insects, and weeds. Blueberry Facts: Information for Scouting and Diagnosing Disease Problems Also available as a pocket guide from Michigan State, these online fact sheets were co-authored by Bill Cline, N.C. State University plant pathologist, and include many photos from North Carolina. N.C. State University Plant Disease and Insect Clinic The Plant Disease and Insect Clinic at N.C. State University provides disease diagnostic and insect identification services to help growers produce healthy plants and crops. Extension specialists from Plant Pathology, Entomology, Horticultural Science, Crop Science and Soil Science diagnose problems on the samples received. North Carolina Pest Management Information Program The program serves as an information resource on current agricultural pest management practices, problems and issues relevant to North Carolina. Timely, science-based pest management and pesticide information is available.